Neshilim, the deposed despot has spent recent months uncovering what led to his downfall. It was the damnable cult and their peasant rabble’s lust for change. Change? For good? What a waste of breath! No peasant would even know what “good” meant… yet they were the reason his colleagues now hung skewered on tall spikes, and he was on the run. The Northern Vidal-Sis, in the vast open marshlands – where no one wanted to be, let alone live – had long sustained a small population of bandits, vagabonds, dissidents, and rabble from surrounding nations. Now and again those nations’ armies would try to hunt down the worst of them, only to inevitably fall to the bog itself. Clearing up the area had never worked out, despite repeated efforts. It had taken weeks of tracking through the vast, smelly swamp to figure out which obscure hideout housed the cult among the random bandit groups. But he finally found it, and it was time to send a pigeon to that irritating halfling. Soon the cult would pay – one bit at a time. 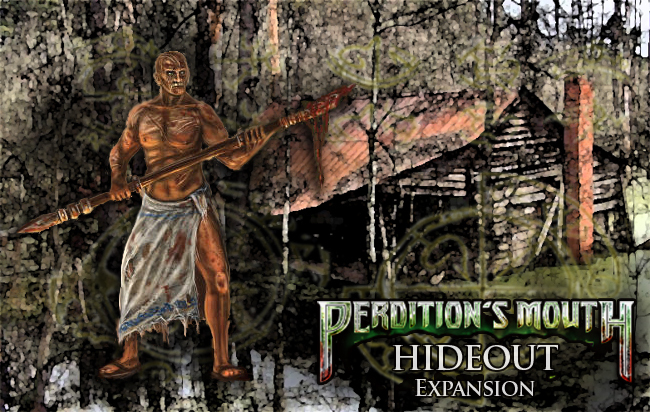 “The Hideout” provides 5 scenarios, which are rather different from the Abyssal Rift main campaign. Should you manage to beat the cult, you’ll secure a safe haven, at least for a time, allowing recovery and restocking. But the cult is relentless, so one day you might find your hideout being overrun. Never feel safe; remain vigilant. What you’ll find in the box are two full-sized maps on a double-sided board. Accompanying that are four scenarios that encompass a story wherein our intrepid heroes encounter a tavern that turns out to be a front for cult operations. The maps include the tavern, its cellar, and the surrounding area. Also included is information on using the tavern as an “HQ” for the heroes to rest up between campaigns and a place to sell off treasures or maybe even resurrect their dead comrades. Will the heroes be able to rescue the hostages that the cultists are holding inside the tavern? Perhaps with the help of Neshilim they can save the bartender and customers before the cultists slaughter them. The civilians will be represented by additional tokens included in the set. Unlike the main campaign, the heroes’ primary goal is to eliminate the cultists so they can make use of the tavern for their own needs. Of course, saving the hostages would certainly gain them benefits too. But as they say, there is no rest for the weary, and as soon as the party is safely inside, the cult will counterattack, and the group must defend their new refuge. Assuming they survive, and have rescued the innocents, they can claim the tavern as a place of respite and succor. They may also find themselves with a share of the six new treasure cards that are included. There has been a question of what good such a home base will do the heroes when they can’t travel there in the middle of the campaign, between scenarios, to heal up. The answer to this is simple – the currently available campaigns, as well as future campaigns that are in the works, are each designed to be completed without leveling up or healing all your wounds in the middle of them. Life is hard near the Rift, and this isn’t supposed to be a cakewalk. But in addition to being a cool set of scenarios you can play before or after a campaign, the tavern can serve as a place to rest, recuperate, and buy and sell treasures in between them. “The Hideout” expansion uses rules for what takes place between campaigns: healing, resurrection, selling and buying treasures, etc. Which actions are available is based on which civilians are present at your headquarters when you visit between campaigns. Civilians around the Abyssal Rift have lives of their own. Like most people, these civilians are focused on making a living, so they aim to profit from your situation; don’t expect acts of mercy. Drawing a -1 or 0 means no civilians are around. A positive number allows you to randomly draw which civilians are present. But beware… Drawing any card with a star (*) symbol means that the cultists have returned to try and regain their hold!. As long as at least one civilian is around, you’ll be able to sell your treasures… who wouldn’t be willing to buy whatever riches you bring back from your adventures? Of course, these poor folks don’t have hard currency, so you’ll have to barter for whatever they have on offer. The rules for running a headquarters and all of its actions will be made available as a free PDF. But of course Neshilim, the physical tokens, the maps, and other components from “The Hideout” will only be available within that expansion. Along with the rules, we’ll provide a basic civilian token design you can print out. We want to make sure everyone can enjoy the role playing and functionality offered by having a headquarters; it will just take a bit of tinkering on your part.